"We have one simple goal: that every single family makes this Shabbat Nov. 11/12 the most meaningful and uplifting Shabbat your family has ever known. Quite a challenge; we are up to meeting it. Log on today and make your plan.” Rabbi Simcha Weiser, Chair Education Committee Shabbat San Diego. Rabbi Weiser was addressing parents of school children. But this is the message for us all: individuals; those affiliated with congregations; those unaffiliated with any Jewish organizations; observant; non-observant; interfaith couples; and those just seeking rejuvenation, renewal and inner peace. Shabbat San Diego has, as part of the International Shabbat being orchestrated in over 500 cities in 65 countries, developed a meaningful, interesting, inclusive and fun Shabbat celebration. 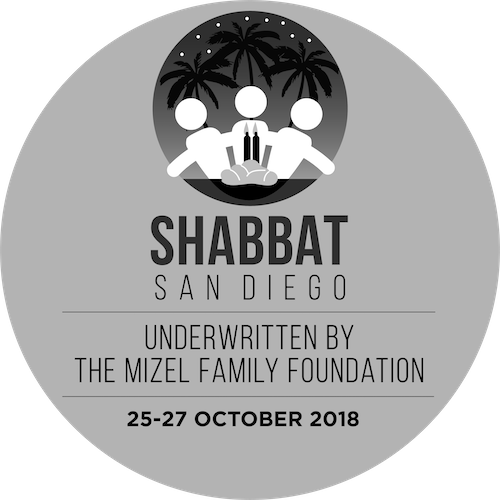 We want more than 20,000 participants to enjoy the beauty of Shabbat by attending the numerous functions in San Diego County and enjoying family as well as old and new friends. PLUG INTO the free communitywide Challah Making on Thursday 22nd and Unity Havdalah celebration with a stirring Havdalah rendition, prior to a leading Israeli singer’s concert on Saturday evening 24th. BUT YOU MUST REGISTER AT www.shabbatsandiego.org to gain admission. Attendance is limited. GET UNPLUGGED from your daily schedule and electronics and join one of the 30 community Shabbat Dinners or 50 Hosted Private Home Shabbat Dinners. Or arrange your own private Shabbat Dinner with friends and let us send you a helpful package and brochure. But PLEASE SIGN-UP at www.shabbatsandiego.org as a participant to show your commitment to restore Jewish pride and identity, and be counted in building Jewish unity across the world. Attend services at one of our 44 participating congregations on Shabbat morning, open to all without cost and take this opportunity for deep physical, emotional and spiritual rejuvenation. Set aside time to rest, to revisit and reinvigorate your most important relationships, and find tranquility. Then attend one of the lectures around town. Learn more at www.shabbatsandiego.org. Make this Shabbat an adventure.